Dinesh Chandimal is favoured to take over wicket-keeping duties when the first Test against Pakistan starts next week, Sri Lanka skipper Angelo Mathews said yesterday. Being well stocked in the keeping department, Sri Lanka’s selectors overlooked Prasanna Jayawardene, who had been a fixture behind the stumps for the Test team, for this three-match series and Mathews said finding someone to fill that place was not difficult. “The top four batsmen in the team are capable of keeping so we don’t have an issue with finding someone for that position. Though we have not made a final decision we are likely to go with Chandimal,” Matthews said. Chandimal last kept wickets in the first home Test against South Africa last year, before being dropped for youngster Niroshan Dickwella, who has also been overlooked for this series. Mathews also said that the decision to recall Jehan Mubarak was a collective decision of those involved in the selection process – the selection committee, the coach and the captain – and contrary to some media reports, was not at his personal request. “We don’t work according to one person’s decisions and we are always looking to do what is right for the team. We always select people who can contribute so it wasn’t my decision or decision of only the selectors – that isn’t relevant here. This was a collective decision,” Mathews said. Earlier this week, the national selectors made a surprise decision to name Mubarak to the Test squad, ending an eight-year Test exile for the 34-year-old batsman. He also said that no final decision had been taken about the inclusion of Kusal Perera, who has yet to make his Test debut, despite being a regular in the limited over teams. “The entire squad can make the team, at any given occasion. It’ll be difficult to decide the first eleven, which is a good problem for the team, so we can’t say if Kusal will play or not,” Mathews said. 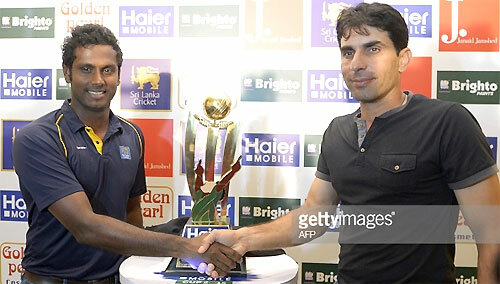 Meanwhile, Pakistan captain Misbah ul-haq, referring to Sri Lanka as a ‘home’ – and rightly so, this being their third tour here in the last four years -- said that Pakistan were motivated by the three backto-back series defeats they suffered on their last tours. “We’re looking forward to a tough series. In our last couple of series we have lost and we really want to play good cricket here,” Misbah said. Misbah also said t hat they were working hard on the challenge of playing Rangana Herath, who was the leading wicket taker in the last series between the two teams last year. “We know that he’s very effective i n Sri Lankan conditions. We’ve got some really good players of spin in our team, and at times we played Rangana really well, but the last series was a really special one for Rangana. Everybody is working on the techniques and he we have some plans to deal with him,” Misbah said. “We know he is a good bowler and really threatening for the team but at the same time at this level if you want to really perform well, you have to cope with these sorts of bowlers” he added. Herath accounted for 23 wickets in that two-match series at an average of 15.13, including a career-best 9 for 127 in the first innings of the second test. The next best bowler in that series was Junaid Khan who, along with Dilruwan Perera and Saeed Ajmal, took nine wickets.